Cashews (roasted In Expeller Pressed Canola And/or Sunflower Oil), Sea Salt. 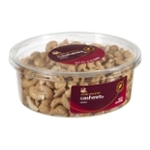 Contains: Cashews. May Contain: Peanuts, Other Tree Nuts, Milk, Soy, Wheat And Eggs. Caution: Package May Contain Naturally Occurring Objects Such As: Pit, Twig, Shell Or Stem Fragments.